First Line: She'd first visited the house up the isolated glen in Sutherland when she was a child. Alice Ramsay is a talented artist who lives alone in a remote area of the northern Highlands of Scotland. She's unconventional, and although she doesn't go out of her way to attract attention, she has her own opinions and isn't afraid to voice them. This has created enemies for her in the nearby village, and the rumor mill insists that she's a witch. When Alice is found dead in her home, the verdict is suicide, but Joanne Ross of the Highland Gazette won't have it. Too many things just don't add up-- like the art critic of rather dubious scruples who writes for a national newspaper... and those officials from some sort of secretive government agency who are also lurking about. They're enough to send shivers down anyone's spine. No. Alice Ramsay did not commit suicide, and Joanne Ross will not rest until she proves it. I've been a fan of A.D. Scott's series since the very first book, A Small Death in the Great Glen. The setting of the Scottish Highlands in the 1950s is vivid, and a rock solid foundation for each book. 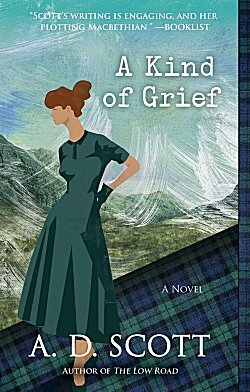 The plot of A Kind of Grief was set in motion by the story of the last witch burned in Scotland. Alice Ramsay is the alleged witch here, and there are alternating sections of the book told in her voice. She's a strong, likable woman with secrets that Scott has readers itching to learn. And what better way to learn them than through the persistence of Joanne Ross, another unconventional woman who's had to fight to find her own path to happiness for herself and her children? Joanne is still recuperating from devastating injuries that occurred in a previous book, and Alice Ramsay strikes a chord with her. Joanne's interest soon turns into obsession, and with those government types lurking in the shadows, it's altogether too easy for readers to begin to fear for this vulnerable woman. But it's not just shadowy agents and oily art critics who need to be feared. There's a small-minded, evil-tongued woman in Alice's village-- the dreaded Mrs. MacKenzie-- who's gone so far past the mere title of gossipmonger that it boggles the mind. Scott uses characters like MacKenzie to prove that danger can live in plain sight... right in our midst. I love Scott's books for their setting and their complex stories, but it's her characters and her insight into human nature that make them dear to my heart. A Kind of Grief is another strong entry in this series, and I look forward to the next. A.D. Scott's writing reminds me a great deal of Louise Penny's, and I would urge Penny's fans to sample life in the Highlands. Scott's characters grow and change throughout the series, so I recommend starting at the beginning. You're in for a treat.